Months before Apple could release a new iPhone that's all screen, glorious screen, Samsung beat it to the punch. Samsung (SSNLF) unveiled its latest smartphone on Wednesday, the Galaxy S8. The sleek phone's standout features are a screen that goes nearly to the edges of the device, and a virtual assistant named Bixby. Can this phone lure away iPhone customers, or at least undermine Apple (AAPL) by featuring similar advancements first? This summer marks the iPhone's 10th anniversary. As it does every year, Apple will likely unveil a new version of the smartphone at a flashy press event. 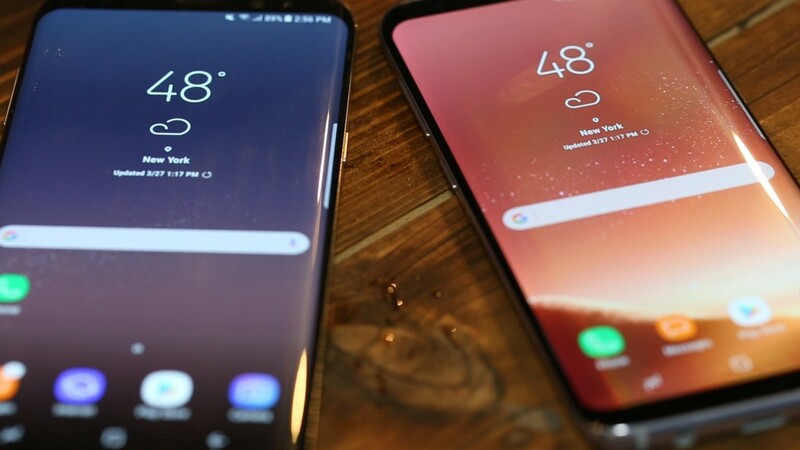 This year, there are heightened expectations that the company will wow customers with something fresh to mark the occasion after keeping the hardware design largely unchanged in recent versions. After a decade of amazing and consistent growth, iPhone sales finally started to cool off in 2016, though they bounced back again this past quarter. "I think it does put a lot of pressure on Apple to show that they can still innovate. Certainly Apple remains the one to beat," said analyst Christopher Voce of Forrester Research. Many faithful iPhone owners have been putting off upgrading to wait and see what the company has in store for this year's model. Rumors include an edge-to-edge screen and the removal of the physical home button -- just like the S8. The new iPhone could also have wireless charging and a slew of high-end camera features. Apple might even skip calling it the iPhone 7S and name it something more dramatic such as iPhone 8, iPhone X or iPhone Pro. The early buzz for the S8 has been mostly positive. That's a blessing for Samsung, which is still reeling from its disastrous Galaxy Note 7 launch last year. The company had to recall, then discontinue, those devices after faulty batteries caused sudden fires. While it's first to the large screen, it's last to the virtual assistant. 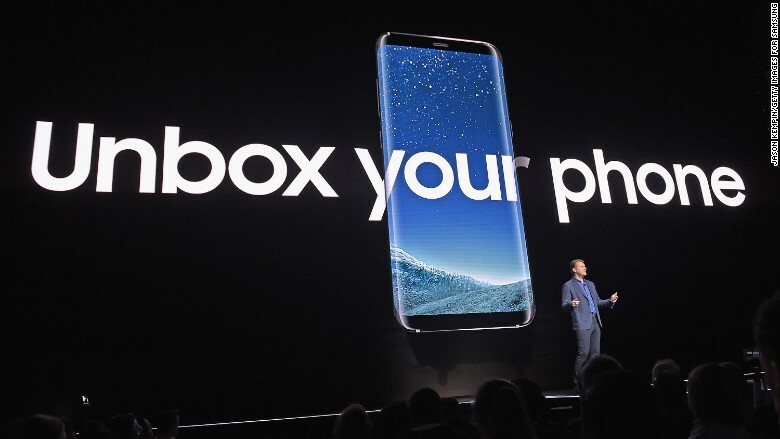 Samsung has jumped on the hottest tech trend and launched its very own voice-activated assistant, Bixby. But early looks indicate Bixby is no Siri. Or Cortana or Alexa. In fact, it seems to do less than other voice assistants while also directly competing with Google's (GOOG) own version which is part of Android. Apple doesn't have to be first to a feature to sell it as revolutionary. In fact, many of its biggest additions in recent years already existed on other devices -- like waterproofing, stickers and animations in messages, and Live Photos, which are similar to animated gifs. The iPhone won't be the first to have an edge-to-edge screen, but you can bet the company will describe it as revolutionary. Jony Ive might wax poetic in a video showing the manufacturing process. The key is making sure Apple executes the feature the best, perhaps by having smaller bezels or none at all. Are people really choosing a phone based on bezels? How many even know what a bezel is (it's the frame around the screen)? There are Android and iPhone people, each faithful to their chosen ecosystems. But some customers are still up for grabs. "You're going to have people in one camp or another, but then a lot of people in the middle who go back and forth," said Voce. We might be running out of ways to truly innovate with smartphone designs. In which case, the battles will be won based on the quality of the design, pricing and perhaps whether or not a device has a headphone jack or catches fire. Additional reporting by Jack Regan.